The coconut (Sanskrit: Sriphala = God's fruit) alone is also used to symbolize 'God'. In India one of the most common offerings in a temple is a coconut. Coconut plays a vital role in all puja rituals. The coconut is a satvic fruit. It is sacred, pure, clean, and health giving, endowed with several properties. It is also offered on occasions like weddings, festivals, the use of a new vehicle, bridge, house etc. It is offered in the sacrificial fire whilst performing homa. The coconut is broken and placed before the Lord. It is later distributed as prasaada. The marks on the coconut are even thought to represent the three-eyed Lord Shiva and therefore it is considered to be a means to fulfill our desires. Why is a coconut offered in prayer? Adi Shankara, the spiritual Guru par excellence, was instrumental in ensuring that this undesirable practice of 'Narabali' was discontinued at many spiritual centres. He denounced the practice as having no spiritual sanction whatsoever. The coconut was chosen as a suitable substitute by people who did not want to give up the practice of 'bali' sacrifice of other beings, but wanted a similar ritual for fulfilment of their desires! Why was the coconut chosen? Coconut plays a very vital role in our offering. Coconut, which has a hard outer cover is broken in temple as an offering for our prayers. But it has more meaning than just presenting Him with coconut. The tender coconut is covered by layers of fiber. The stripping of fiber is to emphasize the fact that we should be devoid of desires. Coconut’s hard cover resembles the head of a human being. Once the coconut is broken, we find a white or grayish kernel. There is also juice present within the coconut. The breaking of coconut is considered as breaking of our ego or Ahankara, because He expects his devotees to be egoless and pure. The kernel within represents our brain. It is filled with inner juice. This represents the internal tendencies of our brain to be jealous, egoist, selfish human being. Usually the inner juice is poured out before offering the coconut to Him, which means that we should remove our vaasanas. So, breaking of coconut stands for surrendering to Him with utmost devotion and love. 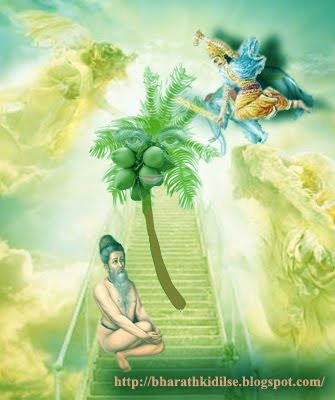 According to Hindu mythology, the coconut was created by Sage Vishwamitra to prop up King Satyavrata who was attempting to gain entry into swargaloka (heaven) as a mortal but was thrown out by the Gods. Satyavrata was a famous king of the solar dynasty. He was a pious ruler and was greatly religious. Satyavrata had only one desire. He wished ascend to swargaloka with his mortal body intact. Once while Vishwamitra was away performing tapsya a great drought swept the land. Satyavrata saved Vishwamitra’s family by giving them food. In gratitude, Vishwamitra agreed to help the king achieve his only desire. He started a yagna (sacrifice to the Gods) and with the powers of his prayers, Vishwamitra made Satyavrata ascend towards the sky. As he neared the gates of heaven, Indra – the king of the Goda pushed the king back to earth. As Satyavrata fell he cried out to Vishwamitra, who cast a spell to stop him mid-air. Enraged Vishwamitra declared his intention to redesign the cosmos and create a heaven for Satyavrata. Peace was restored and a compromise was reached. The Gods allowed Satyavrata to stay mid-air. However, the sage realised that Satyavrata would fall back to ground once the spell weakened. So, he held him with a long pole. 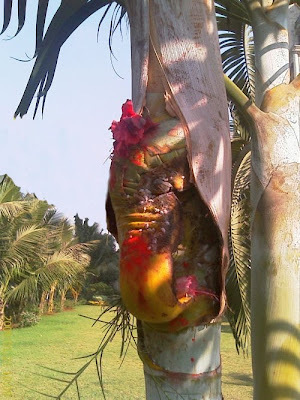 In time this pole became the trunk of the coconut tree and Satyavrata’s head became the fruit. Since, Satyavrata was suspended between space and earth; he got the epithet Trishanku – ‘one who is neither here nor there’. The coconut is also associated with Lord Ganesha. At the beginning of any auspicious task or a journey, people smash coconuts to propitiate Ganesha – the remover of all obstacles. They also break coconuts in temples or in front of idols in fulfillment of their vows. In all sacrificial rites, the coconut is offered as an oblation to the sacred fire. Some people believe that this ritual as well as the customary breaking of coconuts on the altar of deity is associated with the fact that the coconut fruit resembles human head. 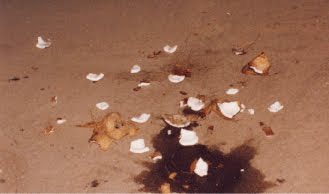 The association of human fertility cult with coconut is prominently manifested during wedding rituals across India. The fruit is often placed in a pot which is a metaphor for the womb, while the nut itself, a symbol or life, confers fertility on the bridal couple. In Gujarat it is customary for the bride to present the coconut to the groom at the time of the marriage. The coconut is then preserved as a precious memento by the husband throughout his life. 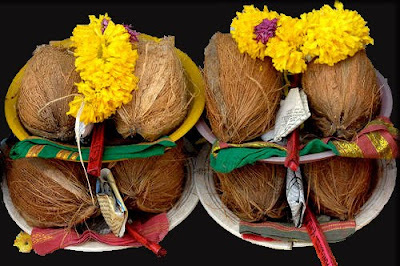 The members of the Prabhu caste of Maharashtra move a coconut around the head of the bridegroom several times and then throw out its pieces in all directions. This they believe will ward off evil spirits. The Nair community of Kerala place a coconut inflorescence inside a wooden barrel filled with paddy grains as the auspicious centerpiece in the kalyanamandapam (traditional wedding podium) of the. In Kerala as well as in the other southern states, during marriages as well as during festivals such Navarathri, it is considered auspicious to distribute coconuts among married women as a part of the tambulam. Among the Tamils, the tali (an important symbol of marriage consisting of a gold ornament stung from a yellow thread) are initially tied around the coconut before it is tied around the bride’s neck by the groom. In north India, when a woman wants to conceive she would go to the temple priest and get coconut. The Gonds and the Bhils of Rajasthan, Gujarat and M.P., a ceremony referred to as the ‘Golgothero’ is organised at the time of the Holi festival. Some jaggery and a coconut is tied on a tree at a good height and all eligible males and females dance around the tree in two separate circles. Any boy who tries to break up the inner female ring is resisted by broomstick beatings. When the boy succeeds in getting the coconut, he is at liberty to select any girl from the formation. Fishing communities along the peninsular coasts believe in appeasing the sea God (Lord Varuna) with offerings of coconut during the monsoon. On the fifteenth day of the bright fortnight of shravana, fishermen especially in Maharashtra celebrate the festival of ‘Nariyal Purnima’. On this day fishermen paint their boats and decorate them with flags. With much rejoicing they throw coconuts into the sea, with prayers for a plentiful fish catch. This festival is a an ode to Sea- god, Varun, a Vedic deity. According to the ritual, coconuts are thrown into the sea as offerings to Varun. Hence, this day has come to be known as Narial Purnima. On this day people go to the sea-shores or river-banks and offer coconuts to the Sea-god. It is believed that with the Varuna's blessings sea-trade will become fruitful and prosper. Hindu married women gather together, play games, sing and dance and put kumkum tilak (Vermilion mark) on each others forehead as the symbol of good luck. They eat together, enjoy the festival and then bid farewell to each other. Fisher-folk welcome this day as the heavy rains finally stop. The coconut also symbolises selfless service. Every part of the tree -the trunk, leaves, fruit, coir etc. Is used in innumerable ways like thatches, mats, tasty dishes, oil, soap etc. It takes in even salty water from the earth and converts it into sweet nutritive water that is especially beneficial to sick people. It is used in the preparation of many ayurvedic medicines and in other alternative medicinal systems. why do married women put rings to their feet fingers? What a nice blog site it is! unbelievable.When I have read this blog I can understand every things I can also learn clearly about Hindu God Brahma.This blog's photos are very nice and bearing the history of religion.So I thing this sites aggregated of all very very reliable like a site . We also apply Hindu symbols on the body of our colored glass Glass. Can women break coconut in temples? Thank you for sharing informative post about coconut which is most important to use in Hindu Bivaah really it is interesting post. What is a significance of offering WHOLE Coconut (unbroken with skin intact) with eyes facing the giver; to a Important Guest who is visiting your family? the above picture ganesh where it is located?